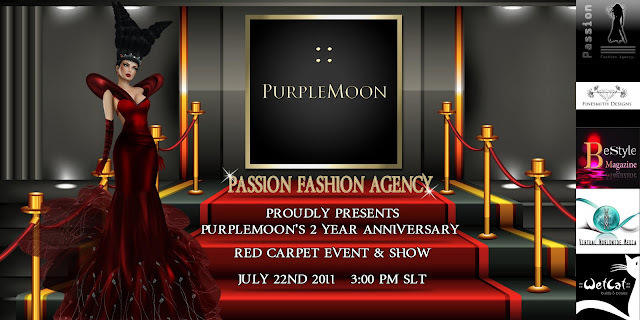 Passion Fashion Agency presents PurpleMoon 2nd Anniversary Show | ! *PurpleMoon Creations* ! PurpleMoon and the nearly 10.000 group members are celebrating the 2nd Birthday of this fantastic SL brand. After awesome anniversary sales, a picture Contest "The Essence of PurpleMoon", and a Mega Party, the celebrations will be finished with a fantastic Fashion Show, hosted by Passion Fashion Agency. You are cordially invited to our red carpet event starting 2.30 pm, enjoy the wonderful voice of Erin68 Frog and admire Poulet Koenkamps best Fashion on Stage showcased by Passion Models.